To boil it down all the way–C.S. Lewis was an atheist and could very easily have remained one all his life: so whatever quibbles we might have with his theology, however late he came to work in the Lord’s vineyard, he did the best he could. If God requires of us more than that, we’re all in deep, deep trouble. I was hoping to watch some BBC Narnia today, but now I have to go pick up a prescription for my cat. Anyway, as I try to rest between books, I thought it might be edifying to revisit the question of whether fantasy can be profitably used in God’s service. I really can’t blame readers who think fantasy is at best idle nonsense, and at worst, some kind of dalliance with the occult. But that can be said about anything, can’t it? There’s music that glorifies God, and there’s music that debases man and everything around him. When was the last time you heard somebody zoom down the road with a hymn playing on his car’s sound system? So of course we can use fantasy in the service of the Kingdom: and the more who decide to try to do it, the better. 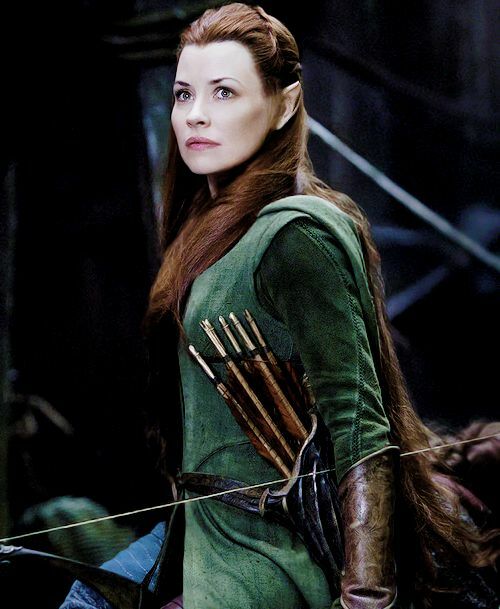 The Invincible Female Warrior who’s not in the freakin’ book… and Tolkien never said his Elves have Mr. Spock ears. Whenever I think about maybe someday, somebody making a Bell Mountain movie, a report like this makes me cringe and shiver. I do understand the unavoidable necessity of making some changes when moving a story from the printed page to the big screen. But the changes made in these “Hobbit” movies, had J.R.R. Tolkien lived to see them, would have killed him dead. Their very existence proves there’s no such thing as a vengeful ghost. Someone around here was enthused enough to prefer my books to J.R.R. Tolkien’s The Lord of the Rings. Well, what can I say? I first read The Lord of the Rings in high school, and it overwhelmed me. My imagination was already on fire, thanks to Edgar Rice Burroughs–first his Pellucidar novels, and then his tales of adventure on Mars. But Tolkien–! I was astonished that such a book could ever have been written. Burroughs’ books are short; Tolkien’s was a monumental trilogy. You wind up spending a lot of time in it. The marvelous thing about The Lord of the Rings was that it positively came alive for me: it made me believe in the story that it told. Perhaps it was the mass of detail: Tolkien’s imaginary world is vast. To this day, after many re-readings, I’m sure I could find my way around the Shire, and I’m sure I’d like it there. And I’d know which places to avoid–Mordor, Mirkwood, and the Mines of Moria. I’ve never seen any illustrations of LOTR which satisfied me. That’s because Tolkien’s art made his people and places real to me, as if I’d actually been there, seen them; and any illustration is, of course, someone else’s imagination, and can never show me anything exactly how I’d already imagined it myself. It gave me a burning desire to write fantasy. I can’t even guess how many pages I turned out in notebooks, and on my old manual typewriter, trying to imitate Tolkien, trying to match him. But I can say it took several decades for me to realize that the world didn’t need another Tolkien: any fantasies I wrote would have to be my fantasies, and no one else’s. And that took another couple of decades to accomplish. It’s important to remember that when LOTR came out, there was nothing else remotely like it. Since then, the fantasy genre has been suffocated with Tolkien wannabes, shamelessly ripping off his once-upon-a-time unique creation. I still love Tolkien’s Elves and Dwarves and warriors, etc., but find everybody else’s cheap imitations intolerable. I suspect that if my first reading had been now instead of then, it wouldn’t have had the impact that it did. Burroughs and Tolkien inspired me, and I doubt my own books would ever have been written if I hadn’t read theirs first. I still stand up and salute The Chessmen of Mars, and in my imagination, search for the road to the forest of Lothlorien. What’s So Hard About Writing Fantasy? When I first read J.R.R. 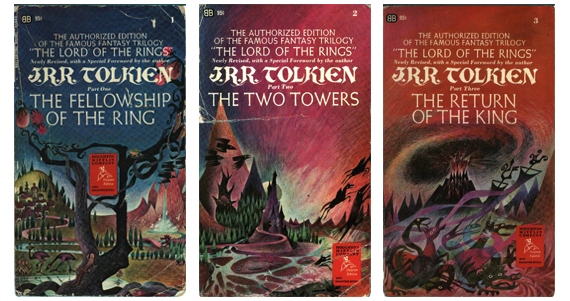 Tolkien’s Lord of the Rings in high school–and I’m currently re-reading it, I don’t know how many times–it blew me away. I didn’t know it was possible to write such stories; but a couple of chapters into it, I knew I wanted to write fantasy. It took me over 40 years to come up with Bell Mountain. People ask me why I have to sit outside to write it. Well, the phone doesn’t ring outside. I’ve got trees and sky, birds and squirrels, to keep me company. And I have to get myself into a world that doesn’t exist except in my imagination. I have to be able, in my mind, to see it and hear it and touch it. This takes a great deal of concentration, easily broken. I have to relate to characters that I invented as if they were real. Although I’m inventing what they say and do, think and feel, I can’t just have them do anything I want. They have to behave as if they really live. Again, lots and lots of concentration. A character like Helki the Rod doesn’t just grow on trees. He has to say and do whatever he would say and do if he were real. I have to see these landscapes, it has to be a movie in my mind. And I have to resist the temptation to load my story with elves and dwarves and wizards and all the other stock characters that burden so many other fantasies. No invincible female warriors, no crusty but benign old sages. Impossibly beautiful, know-it-all elves, uh-uh. Otherwise, next thing you know, all you’ve got is a pile of cliches. It’s all very difficult, a constant challenge–but it’s the kind of work that I love best. The finished product has to be very different from everybody else’s finished product. I reach back into vanished worlds of the long-gone past and pluck out animals that most of my readers never heard of before. Creatures known to us only imperfectly, from bones and scientific speculations that may or may not be accurate. Nor can I do any of this without prayer. Lots and lots of prayer. Which leaves me, when a book is finally done, figuratively gasping for breath and wondering, “Well, now what do I do?? ?” But the Bell Mountain stories are a kind of history, and in history there’s always yet another chapter. Some of you are down on movies and television for celebrating immoral and even wicked actions and letting the characters in the story get away with it. Those are not unfounded criticisms. As a fantasy novelist, I must plead guilty to writing in such a way that the story turns out as I want it to. King Ryons gets to Obann in time to save the city. Lord Orth passes through a phase of madness and idiocy to emerge as a true man of God. These things happen because I wrote them that way. It can’t be helped. I watch a lot of old TV and movies. One reason is for relaxation. After a day of writing, I need to veg out. I don’t think any of you will accuse me of allowing these films to shape my moral outlook. Writing a novel isn’t as easy as it looks. The only thing easy about it is that it’s very easy to mess it up. And as I write, I have two overriding concerns: character and story. Both have to be right, or the novel will be wrong. So I watch for the same reason I never go to bed without a book to read until I fall asleep. I want to learn how to create and manage believable characters that my readers will respond to, and how to tell a story coherently, convincingly, and compellingly. I can’t learn that unless I immerse myself in other people’s stories. And because the story-telling art is so difficult, I have to keep learning all the time. As hard as I try to avoid it, some of the stories I watch turn out to be dreck. From these I learn what not to do! From the others, the ones that are not pigs’ breakfasts, I pick up innumerable hints that I can apply to my own stories. From C.S. Lewis, Agatha Christie, Walter R. Brooks, J.R.R. Tolkien, Edgar Rice Burroughs, Arthur Upfield, and many others, I learn the techniques I need to make my novels stand the test of readership. And daily Bible reading is indispensable as a guide to what I ought to put into my stories and what I ought to leave out. As a writer, I can do nothing without God’s blessing and guidance. A steady diet of B.S. fiction, consumed uncritically, unthinkingly, for no other purpose than “because it’s there,” has a really good shot at rotting the consumer’s mind. If you want to be a musician, you have to listen to other people’s music. The same hold true for story-tellers. Warning: This video might send you screaming to the sidewalk. The management takes no responsibility. I love Tolkien and I love Leonard Nimoy; but put them together, and the result is jaw-droppingly awful. I mean, people have been put to death for lesser crimes. Who among you is tough enough to watch all two-and-a-half minutes of this horrific video? There are hundreds of characters in J.R.R. Tolkien’s The Lord of the Rings, but only one that stirs me to the point of tears: old Theoden, King of Rohan. I love this guy! And I do mean love–as if he were my grandfather. How in the world did Tolkien do that? When we meet him, Theoden is a broken-down old crock who has been skillfully manipulated to sap his morale and make him feeble before his time. But he comes back from that. The hero inside him, once he has been healed by Gandalf, bursts out like a fireworks display. At the same time, he is gentle, kind, and even humble: and everything he does, everything, is motivated by just one thing–by love. Love for his family and friends, love for his allies in the war, love for his country and its traditions. And love for every little thing with which he has been blessed. Love that is willing and able to sacrifice himself for what is right, for what is true. Tolkien doesn’t tell us so. That never works. He shows it in what Theoden says and does, in his every word and action. Easy to say, but hard to do. If great art was easy, everyone would do it. It really is an amazing feat of art to create a character that a reader can actually love. Lots of authors can create characters that amuse us, or annoy us; but to inspire love is something special. Hard to do: but for any writer, well worth trying.